The analysis of the international migration flows, their determinants and the impact on host countries' labour markets is of great interest in the context of current European developments. 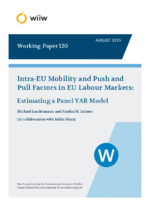 This paper analyses the role of EU labour market mobility, specifically cross-border mobility by migrants, in labour market adjustments and, vice versa, how labour market developments across the EU in terms of relative wage differences, differences in activity rates, in labour productivity differentials and in human capital structures affect labour mobility. The analysis is carried out in the context of estimating a panel Vector Auto Regressive (pVAR) model involving bilateral net migration flows and cross-country differences in the above variables. It is estimated for the period 2000 to 2012, thus capturing also the two waves of accession of Central and Eastern European new Member States (NMS). The estimations are performed for cross-border mobility patterns for the EU as a whole, as well as for the migration patterns between NMS and OMS, thus analysing the changes which the integration of new Member States may have caused to labour market and mobility dynamics in the European Union.